On page 144 of “PEYTONs Along the Aquia,” I have recently determined that the children I had given to #172 James PEYTON were actually the children of his brother, #170 Charles PEYTON, on page 142. James PEYTON, according to the 1820 Census of Stafford County, Virginia at Falmouth, seems to have had children, however, at present, I am not certain of their names. I had gleaned the children of James PEYTON from an affidavit in the Revolutionary War Pension of his brother Charles PEYTON. Yesterday, while researching at the National Archives, I discovered that there was a clerical error in that document. Twice the phrase appears that “James PEYTON, Thomas PEYTON and Nancy LIMBRICK” were “heirs at law of James PEYTON, deceased.” Whoever created the 1852 document obviously meant to write that the three named PEYTONs were “heirs at law of Charles PEYTON, deceased,” the Revolutionary War soldier, brother of James PEYTON. On page 168 of “PEYTONs Along the Aquia,” I have recently determined that #267 Nancy PEYTON is the daughter of Charles PEYTON, not of James PEYTON. She is a niece of James PEYTON. I had interpreted her ancestry using an affidavit in the Revolutionary War Pension of Charles PEYTON. Today, I made a new search of the pensions at the National Archives and found that I have overlooked the last page of his pension. This new revelation caused me to reassess the affidavit I had used to determine the genealogy of this family. I have now concluded that it contains clerical errors. Twice in the document is the phrase that “James PEYTON, Thomas PEYTON and Nancy LIMBRICK” were “heirs at law of James PEYTON, deceased.” Whoever created the 1852 document obviously meant to write that the three named PEYTONs were “heirs at law of Charles PEYTON, deceased,” the Revolutionary War soldier. The Pension was rejected by the War Department because he did not serve for the required six months. Charles PEYTON seemed to believe that he did indeed serve that length of time. However, no descendants of Nancy LIMBRICK have ever documented their ancestor Charles PEYTON for the DAR, and he still should qualify as a DAR Patriot for his service during 1781, in the Virginia Militia. 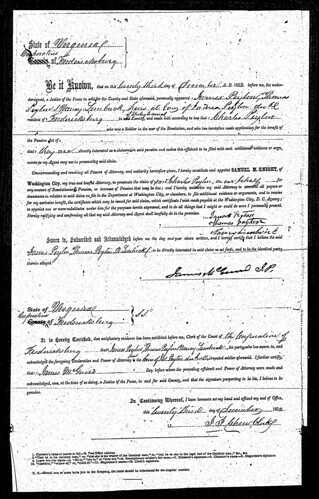 The image, Charles Peyton Revolutionary War Pension File, was originally uploaded by barneykin. It is posted here from Barneykin’s account. Regarding the family of Francis PEYTON (1764-1836) on page 117 of “PEYTONs Along the Aquia,” 2004, it seems the source that I used (#434-#441, page 216) contained a number of inaccuracies. I will update those that I have found so far. There is a Bible record that documents that on 20 October 1789, Francis PEYTON married Sarah FOUSHEE: “Francis PEYTON and Sarah FOUSHEE were married at Alexandria the 20th October 1789.” Sarah (Foushee) PEYTON left a will in Alexandria County, Virginia dated 12 November 1848 (Will Book 5). Francis PEYTON died at Alexandria County, District of Columbia (now Virginia). I find no documentation that Francis PEYTON married before 1786, to a Sarah WEST (1769-1849), as given by source #435, and I do not know who she is. The son of Francis PEYTON #207 on page 216, is recorded in the PEYTON bible as “Thomas Jefferson,” with a birth-date of 30 September 1797. I am not certain of the ancestry of Thomas West PEYTON (a1782-1819) who served during the War of 1812, and married Sophia Matilda DUNDAS. I will make a future posting regarding my findings of a Sarah WEST who did marry into the PEYTON family. This is the Sixth Correction to my Peyton book – “PEYTONs Along the Aquia,” published 2004. Here is a link to a post on GenForum about this Francis PEYTON, which agrees with my own research: Wesley E. Pippenger. 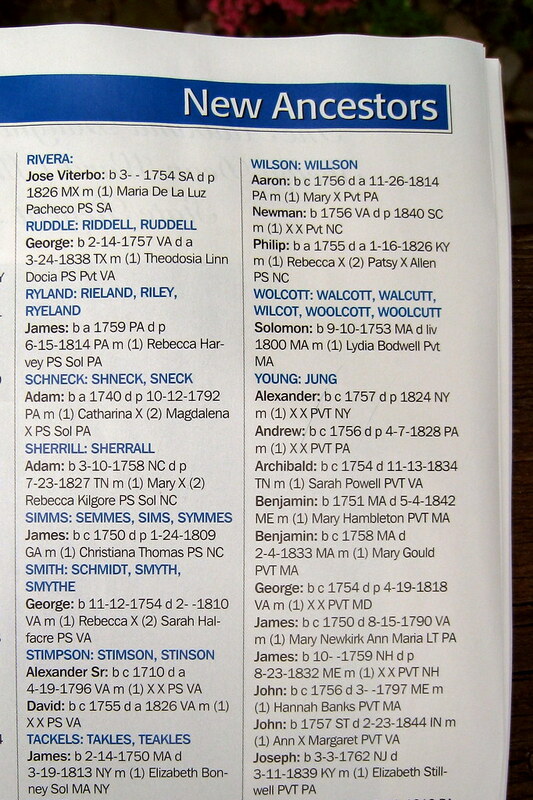 The latest issue of the NSDAR Magazine, May/June 2008, lists my patriot ancestors, Alexander STINSON Senior and his son David Stinson, of Buckingham County, Virginia, as new patriots of the National Society Daughters of the American Revolution. UPDATE: If anyone has comments to make about the STINSON family, please go to my blog on the STINSONS: “The Stinson Book.” Thank you.